Condition: Pretty good for age, but areas of wear, and corrosion of the dark brown (natural iron oxide dye) which is normal in old Baluchis. Repairs to the side cords. 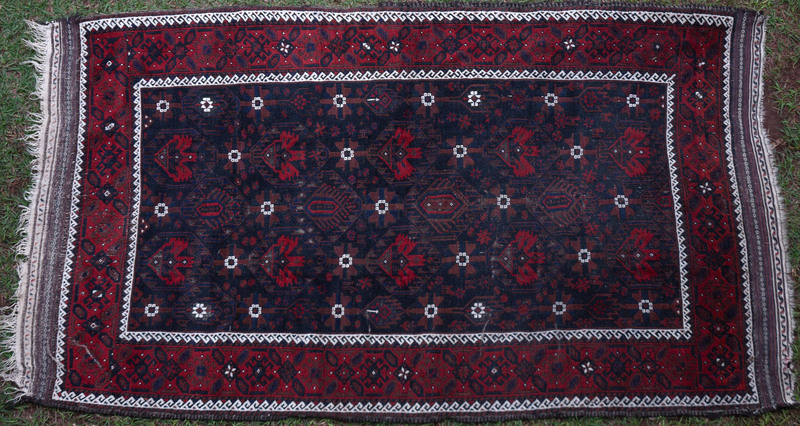 Notes: Lovely warm madder red/brown and dark indigo, with highlights in white, make for an impactful tribal Baluch rug. The design is an interesting take on a geometrical floral one, and includes small animal motifs. It is unusual to find such intact kilim ends on Baluch rugs of this age.